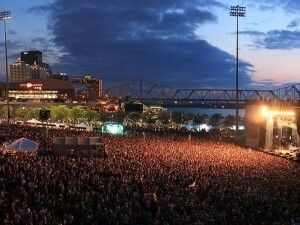 LOUISVILLE, Ky. (Jan. 26, 2015) — One of the nation’s premier summer musical festivals has signed an extension to remain in Louisville through 2019. Mayor Greg Fischer joined Waterfront Development Corporation president David Karem and Forecastle Festival Founder J.K. McKnight to announce today that the Forecastle Festival has signed a five-year commitment to stay at Louisville Waterfront Park. Last year the three-day festival, which celebrates the best in music, art and environmental activism, featured Beck, Jack White, Outkast, Band of Horses, Dwight Yoakum, The Replacements and Spoon among the more than 50 acts that performed. This year’s line-up is scheduled to be announced on Tuesday. In recent years, Forecastle has attracted more than 60,000 attendees per year from 49 states and more than 10 foreign countries. About 58 percent of attendees come from outside Louisville. An economic impact study revealed a more than $14 million economic impact on the city. “The energy and activism of Forecastle is a perfect fit for our award-winning and world-class Waterfront Park, both keep getting better year after year,” Fischer said.